What's so special about HPB? 1. Why should I think about becoming a Holiday Property Bondholder? 2. How often can I go on holiday? 3. Can family, friends and pets join me on holiday? 4. What facilities and standards can I look forward to? 5. How does HPB deliver good value holidays? 6. How long will I be able to holiday with HPB? 7. How are my holidays protected against inflation? 8. Who are HPB and how long have you been going? 9. That’s all fine, but can I afford it? 10. What if I decide it’s not for me? 11. How do I find out more? Why should I think about becoming a Holiday Property Bondholder? As soon as you become a Bondholder, you can take your pick from over 1,400 exclusive holiday properties situated at more than 30 fabulous locations across the UK and Europe. There are 17 locations in the UK alone, and more properties are being added all the time. Whatever you like in a holiday, you’ll love the variety available with HPB. From the sun-drenched Algarve to the majestic Highlands of Scotland, from converted traditional cottages to contemporary hotel apartments, there are HPB properties to suit every taste. As Bondholders you can holiday in the location and property of your choice, at any time of year. Most properties have a range of excellent facilities on site, including heated swimming pools, gym equipment, games rooms and libraries. We love it; we've always sought variety, and the Holiday Property Bond gives us that, in spades. You know you're going to be comfortable and everything's going to work. Holidays can be looked forward to with excitement, rather than trepidation. We've taken nigh on 100 great HPB holidays at over 20 sites since we signed up. Our daughter and partner join us when busy lives permit and also go without us; indeed our Holiday Points have been to places we have not seen. We have also taken full advantage of the Points-free short-term vacancies and cancellations! How often can I go on holiday? It's up to you. How often you can go away depends on how much you invest, when you want to go and the availability of the properties you're interested in. Many Bondholders are able to get away three, four or even five times a year. We can arrange your holiday travel for you. As a Bondholder you can book everything from flights to ferries and from insurance to car hire through the HPB Travel Club, our dedicated, ABTA-bonded travel agency. Our experienced, knowledgeable staff are just a phone call away. Can family, friends and pets join me on holiday? Of course. HPB holiday homes range from modest, one-bedroom apartments to large, family-sized villas. Whether you are holidaying as a couple or bringing the whole family, there are properties to suit you. You can also invite friends to come on holiday with you and share your HPB accommodation. All our UK locations have ‘pets welcome’ properties (except for our hotels and Barnham Broom), as do five of the overseas locations. A number of our properties are wheelchair friendly and others are designed for people with limited mobility. For me, the great thing about HPB is its flexibility – the fact that friends, family and colleagues can use it. This is very much a girls'-only holiday; lots of chat, lots of laughs, lots of relaxation – just lazy days in the sunshine with one's best mates. A large part of a successful holiday is knowing what to expect, in terms of the standard of accommodation, facilities and so on. HPB scores highly in this regard. The result: fun for the children; relaxation for the grown-ups; and a comfortable holiday for all! What facilities and standards can I look forward to? HPB was set up to ensure holidaymakers enjoyed the same consistently high standards of comfort and service on every holiday. All our villas, apartments and cottages are fully self-contained and individually furnished to high standards by our interior designers, who take the local setting into account. We regularly refurnish and improve our properties, and every property will be freshly cleaned and prepared for your arrival. HPB properties are set in their own well-cared-for grounds and gardens, a number of which have won awards. Most also have facilities such as swimming pools, saunas, games rooms and tennis courts on site. Some of our locations also have their own restaurant. How does HPB deliver good value holidays? As a Bondholder, you can access holiday benefits through our Holiday Points system. Each £1 you invest entitles you to one Holiday Point every year. Every time you book a holiday, you exchange Holiday Points for the property you want. The number of points you need will depend on the location of the property, the property size and the season. You also pay a no profit user charge, rather than a commercial rent. This stays the same throughout the year, so there are no sudden hikes in the holiday season. To give you an idea of the cost, a studio for two would cost around £300 a week, while a two-bedroom property sleeping up to six would cost around £460 a week. You will also be able to take advantage of a wide range of special offers, such as short-notice Points-free holidays and long-stay vacations at particular locations. One thing that's common to all HPB holidays is the quality of the sites, and the site staff. From the manager downwards, everyone, at every HPB site, is dedicated, caring, and committed to ensuring that we as Bondholders have the best holidays possible. The Bond allows us to spend quality time with our children and grandchildren. And it's great to know that our three children will continue to benefit from the Bond, and enjoy HPB holidays long into the future. How long will I be able to holiday with HPB? 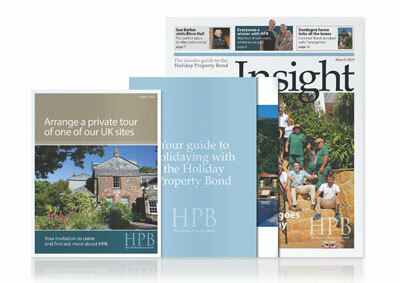 You can holiday year after year with HPB, as your Holiday Points are reissued every year for life. The holiday benefits don’t just last for your own lifetime either. Thanks to the nature of the underlying investment, you can pass your Bond on to your children and grandchildren for them to enjoy or cash in if they prefer. How are my holidays protected against inflation? You can look forward to the same level of high quality holiday entitlement for the whole of your lifetime, no matter what happens to inflation. That’s because your Holiday Points allocation is revalued at least once a year in line with the cost of providing additional holiday accommodation for new investors. The booking power of your investment is fixed and protected for the long term, no matter what happens to inflation. In the two decades-plus we have enjoyed as Bondholders, the Bond has fulfilled its 'sales-pitch' promises. Through the automatic inflation-proofing, our original investment would still be enough to stay at Rocha Brava, in the Algarve, for two weeks in high-season. I know many Bondholders have added to their investments over the years. And that's fine; if you've got a growing family and the wherewithal, then go for it. But my annual Holiday Points allocation was enough for my husband and me. Who are HPB and how long have you been going? The Holiday Property Bond was founded in 1983 by two families who wanted to make sure that discerning holidaymakers could be confident in the holidays they booked. The Bond enabled investors to holiday in properties by paying a no profit user charge. Today there are over 42,000 Bondholders. As a Bondholder, you won’t own the properties directly. Your money is invested, after charges, into a fund which had net fund assets (properties and securities) of over £300 million as at 31st December 2018. The fund has no borrowings, and never has had. It also has an independent trustee, HSBC Trustee (C.I.) Limited to whom your investment will be payable. As HPB is an investment product you need to understand the principal risks and costs as well as the benefits. You can find a summary here. That’s all fine, but can I afford it? HPB is more affordable than you may think. The minimum initial payment is just £5,000, and the average investment is currently around £14,000. We can help you get started with an interest-free loan of between £3,000 and £9,000, repayable in 12 equal monthly instalments (subject to a minimum cash deposit of £2,000 to £4,000). Thereafter there is a quarterly charge of around £30 (that is around £120 a year). We were introduced to the Bond by a friend, and subsequently visited HPB's Braithwaite Court in Cumbria. We liked what we saw. As investments go this is not a 'money-maker'; but the pay-back, in terms of super holidays and uniformly high standards, has been out of this world. If you take your first HPB holiday within three years of investing and are not, for any reason, entirely happy, you can apply to cash in your HPB investment within 14 days of your return. Whatever the encashment value, the parent company of the issuer of HPB will make up any difference. That means you will get back the full amount of your original payment, including charges. This offer applies to the first holiday at any HPB-owned property which is taken by at least one of the Bondholders themselves. We will give you full details of the offer before you invest. We give you the chance to find out about the Bond in your own way and at your own pace, without any hard sell. The first step is to order your free copy of our full colour brochure. Once you have read the brochure, you can arrange a meeting with one of our representatives, at a time and place to suit you. If you like, you can meet them at an HPB holiday location to get a feel for our high standards of accommodation. Our representatives can give you all the information you need but you can, if you wish, view the full Product Particulars here. How different could our lives have been had we not mistakenly dismissed HPB 20 years ago? Think how many more memorable holidays we could have taken. If only we had known then what we know now!